Statements that contain multiple currencies, for example non US Dollar currencies remain in the original currency denomination. An alternative to the IIF download can be achieved by downloading a Tab delimited - completed payments file and import the transactions using Zed Axis. The benefits being transactions can be imported as Sales Receipts, reducing the need to enter the sale in the first instance, unmatched Inventory and Customer records can be added on the fly, easier to cater for multiple currencies, customer contact details can be updated and additional information can be recorded on sales. Exporting your transactions from Paypal. Select the format of the files that you wish to download, Text Delimited - Completed Payments, if you wish to update shopping cart details select the option to include shopping cart details. Open Zed Axis and connect to your QuickBooks company file. 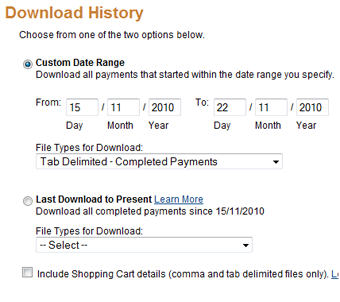 Browse to where the Paypal download file was saved and select the Tab delimited option. Setup a mapping between the fields in the Paypal download file and the QuickBooks Sales Receipt. You can map the data as you wish, but as a minimum you must provide a Sales Receipt reference number and Item and a Customer. You have a number of advanced features to manage the way that you import the Paypal transactions into QuickBooks , you also can choose to update address and contact details in QuickBooks, skip if the transaction already exists in QuickBooks. Finally, click the import button to commit the import directly into your QuickBooks company file.